The coral reefs that form the GBR are scattered over the continental shelf, which is shallow and fringed by the deep water of the Coral Sea (Fig. 4.1). Oceanography affects in many ways the organisms and the nature of contemporary geological processes. Seawater erodes and shapes reefs; it influences the transport of sediment and the deposition of material to the substratum. Organisms of all sizes are affected by oceanography. The storm generated seas of cyclones destroy reef structures, kill organisms and alter the nature of habitats. Changes in habitats can in turn affect organisms that typically 'respond' to different habitat types and the influence of oceanography on habitats can influence broad scale patterns of bio-geography. The richness of inter-reefal and reef based flora and fauna are strongly influenced by nutrient input from rivers and upwelling over the shelf break. In the pelagic environment, plankton have limited control of their horizontal movements and, therefore, transport and dispersion will be influenced by currents. Eckman transport. Wind-related transport where the upper water layer drags the layer beneath. The rotation of the Earth (= Coriolis effect) results in a slight change in current direction with depth. In the southern hemisphere, average transport in the Eckman layer is to the left (opposite for northern hemisphere). Halocline. The region of transition between low salinity waters and high salinity waters. Internal wave. The result of a deformation or perturbation of the thermocline. Internal waves can be solitary (solitons), or often occur in groups (packets). Internal waves can channel cool water to reefs and influence transport of organisms in slicks at the surface. Plankton. All organisms that are considered 'wanderers' or 'drifters'. Plankton includes viruses, autotrophs and heterotrophs, phytoplankton and zooplankton. Pycnocline. The region of transition between low density waters and high density waters. Sigma-T. A measure of water density. Water density is explained by water temperature (about 65% of the relationship) and salinity. Thermocline. The region of transition between warmer surface waters and colder deep oceanic waters. Upwelling. A process whereby cold, generally nutrient rich waters from the ocean rise to the surface. the GBR and favourable currents may sweep them towards reefs, either other coral reefs (meaning the reefs are then connected) or their natal reefs (meaning the reef is self-seeded). Oceanography affects the GBR at large and small spatial scales. At the largest spatial scales (thousands of kilometres) major oceanic currents of the Coral Sea bath the GBR, affecting patterns of connectivity between reefs and the likelihood of coral bleaching. At very small spatial scales (centimetres to metres) small scale turbulence can affect the settlement patterns of organisms such as corals. The oceanography of the GBR is affected by oceanic currents, tides that flow on and off the shelf, complex topography that generates jets, eddies, stagnation, and convergences, and wind that varies in direction and strength with time of year. Variation in vertical physical structure (i.e. thermoclines and haloclines) and the input of freshwater and mud from rivers also affect water density and related currents. Across the shelf, near-shore waters are often impacted by freshwater whereas outer reefs are more affected by upwelling. flowing East Australian Current (EAC) south of the bifurcation point and the northward flowing Coral Sea Coastal Current (CSCC) north of the bifurcation point. The bifurcation point fluctuates between Townsville and Lizard Island. The EAC does enter the reef mosaic of the GBR and generates a coastal GBR lagoon flow from the Central GBR to the Swains (Fig. 4.3). This flow is weak and episodic compared to the flow on the outside of the reef. In southern Queensland this boundary current can reach speeds of over 0.5 m s1. The influence of the EAC extends over a 1000 km south of the GBR and veers eastward, forming a temperature discontinuity called the Tasman Front. (Fig. 4.4). It turns east at Cape Leeuwin, where it becomes the South Australian Current, and flows eastwards below most of South Australia to Tasmania, where it is known as the Zeehan Current. The LC creeps closest to the coast near Ningaloo, about 1200 km north of Perth, where the current may be only 10 km off the coast. The thermal signal of the LC can be readily detected at Port Lincoln. The EAC and LC both carry warm and clear waters that are nutrient poor (oligotrophic). The direction of transport and the oligotrophic waters have a great influence on the biogeography of the east and west coasts. Corals are found as far south as Rottnest Island in the west and near Port Stephens in the east. On both coasts, the larvae of tropical species are advected south. A host of newly settled tropical fishes and invertebrates often arrive at high latitude toward the end of the summer, but few survive the cold of winter. The northern extent of macroalgae (e.g. Macrocystis and Ecklonia) is also affected by warm currents, as these algae cannot persist in warm and nutrient poor waters. Global warming will cause changes in the physical and chemical oceanography of the GBR as well as related biological change. There is great speculation on exactly what will happen, but predictions include the following: global warming is likely to cause increases in the frequency and duration of bleaching events on the GBR through warm water intrusions. Storm frequency and intensity may also increase and this will have a direct physical affect on reefs. Increased freshwater and nutrient input from cyclones would facilitate phase shifts from coral-dominated to algal-dominated inshore reefs and the nature of the pelagic environment would change as would its suitability to the survival of larvae. For example, the survival of crown-of-thorns starfish (COTS) larvae may increase, causing greater frequency of COTS outbreaks. Other forms of plankton, however, may struggle with major changes in the abundance and species richness of the plankton. An increase in atmospheric CO2 will lower the pH of the sea so making it more acidic (0.3-0.5 of a pH unit by 2100). This is critical for corals, shellfish and some plankton (e.g. coccolithophores) because a reduction in pH affects carbonate concentration ions, making it more difficult to precipitate calcium carbonate. world have been recorded during La Nina and El Niño, but the biggest bleaching events have been recorded during El Niño conditions (1998 and 2002). Patches of water that generally exceed 31°C stagnate on the GBR and when they remain in areas for too long the symbiotic algae of corals (zooxanthellae) are lost and in severe circumstances the coral will bleach and die. 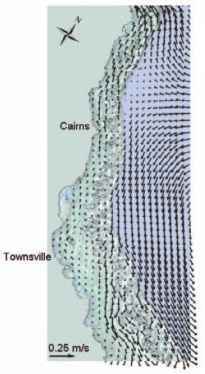 Tides have a great influence on currents within the GBR lagoon. The tides flow on and off the shelf, resulting in a considerable east-west movement of water. Maximum amplitudes of tides, by area, on the GBR range from 2.5 m to 7 m. The tides are generally semidiurnal (twice per day) and spring tides generate greatest currents (cf. neap tides). In regions that include the southern GBR and northern regions, tidal currents of 1 m s1 are generated through channels between coral reefs. Numerical models of particle transport indicate that particles can travel about 15 km westward on incoming tides and 15 km eastward on outgoing tides. 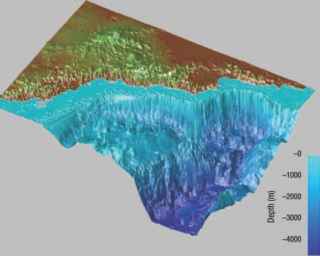 Tide and bathymetry are critical components of oceanographic models. The interaction of tidal currents with the EAC depends on the region on the reef and distance across the shelf. Where the EAC enters the GBR in the central region and forms the lagoonal current that flows south, particles move on an east-west axis with the tide and there is some movement to the south as a result of the EAC. The influence of the CSCC (flowing north) on inter-reefal waters of the northern GBR is lower and the residence time of water masses tends to be greater in this area, therefore, the effect of tide generally dominates here. Topography has a great influence on currents of the GBR and over 2500 reefs generate great complexities in flow. Complex bathymetry and channels generate water jets, eddies and convergence zones such as thermal fronts and internal waves. All of these features have a great influence on the transport and aggregation of plankton, connectivity of larvae among reefs and the aggregated plankton is often an attractant for nekton. retain particles (including larvae) near individual reefs or regions through cyclonic transport or through aggregation in convergence zones and they can influence local upwelling of nutrient rich water. Water jets through the Ribbon Reefs of the GBR on the outgoing tide and generates complex three dimensional structures that extend hundreds of metres to over a kilometre from the edge of the reef (Fig. 4.6A-B). Floating particles are captured and aggregated along slicks by these circulations at the convergence zone or along the leading edge of the jet. At rising tide, a bottom-tagging, cold, nutrient rich water mass is formed by a Bernouilli-effect upwelling water on the oceanic side (Fig. 4.6C); the primary beneficiary may be the Halimeda algae that form large meadows near these passages. 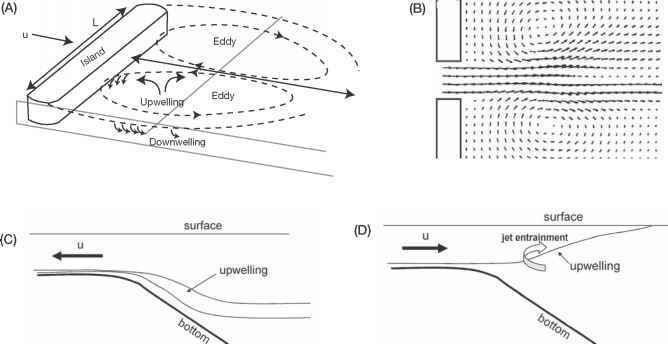 At falling tide, the water leaving the continental shelf forms a buoyant jet that lifts off the bottom and vertically entrains deeper oceanic water (Fig. 4.6D); this up-welling may explain the aggregation of black marlin in front of these passages. Figure 4.6 Topographic influences and density driven flows. A, Sketch of the 3-D circulation in an island wake (u is the undisturbed current speed upstream of the island, L is the current speed in the eddy, and W is the width of the island). (Modified from Wolanski et al. 1988). B, Model-predicted currents near a reef passage showing the formation of a mushroom jet at rising tide. (Modified from Wolanski 2001). C, Internal structure within the jet at flood tide showing the Bernouilli-effect upwelling of deeper, colder, nutrient-rich oceanic water into the reef passage and the jet-driven landward movement of that passage (u is the water speed in the passage). D, Internal structure at ebb tide showing upwelling by jet entrainment seaward of the reef passage (u is the water speed in the passage). E, Internal structure of a riverine plume exiting from the mouth of the river and advecting along the coast. Downwelling occurs at the front and entrainment of coastal waters under the plume. (Modified from Wolanski 2007). F, Density currents generated by muddy water escaping from Trinity Bay off Cairns, cascading down to deeper water and being entrained by the prevailing currents on the shelf. (Modified from Brinkman et al. 2004). southward mean oceanic current. By turbulent mixing, the width of the plume grows as the water moves northward away from the river mouth. 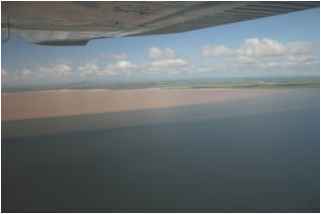 Strong winds entrain muddy sediment in suspension in embayments, such as Trinity Bay in the Cairns region of the GBR. When the wind calms, this water is negatively buoyant because of the sediment load; the density-driven flows makes this water cascade downward into deeper water as a bottom-tagging nepheloid layer a few metres thick, carrying the mud towards coastal and inner shelf reefs that it will help degrade (Fig. 4.6F). Convergences are caused by a variety of physical features that include, eddies, jets, wind, fronts, internal waves and freshwater plumes. Convergence zones accumulate plankton and floating objects such as flotsam, drift algae (see Chapter 14) and aggregations of cells (e.g. Trichodesmium). The convergence zones of windrows that form parallel to the direction of the wind are Langmuir cells and aggregate floatsam and organisms such as plankton, coral eggs and jellyfish. Tidally induced fronts are generated through differences in the density of waters masses, differences in depth (i.e. water will travel relatively faster in deeper water creating a shear zone or convergence), and the edge of eddies. When lagoons heat up, sea water becomes less dense and on the outgoing tide a thermal front will form where the warm water meets relatively cool inter-reefal waters. The differences in temperature can range from 0.2 °C to 1.5 °C and a convergence will form at the front. These and other tidal fronts generally dissipate with a change of the tide. Internal waves result when there is a density difference with depth and on the GBR this is usually restricted to reefs on the outer shelf and in the Coral Sea, such as Raine Island. Internal waves commonly also form near the shelf break from tidal motions. The outgoing tide deforms the thermocline downward and as the tide changes to flood it perturbs the thermocline and propagates a packet of internal waves shoreward. Parallel convergences form at the surface over the rear of each wave and aggregated material is transported shoreward. The largest internal waves in the world (amplitude of 270 m) have been found around isolated oceanic coral reefs. The deformation of the thermocline upward over a reef combined with channeling by local topography will result in benthic organisms being bathed in cool water and this can constitute significant upwelling events (enhancing productivity) and thermal shocks (stressing organisms). Wind has great influence on currents. Although tides and the EAC are important, the direction and intensity of wind also greatly affects water movement. Although transport by the wind is downwind at the surface, this is not the case through the whole water column. Transport of particles in the wind affected layer (Eckman layer) deviates to the left in the southern hemisphere with depth and more to the right in the northern hemisphere as a result of the rotation of the Earth. On average, therefore, particles will be transport toward shore in the Eckman layer with a wind from the south and offshore with a wind from the north. When surface waters are transported away from the shore, a sea level low is created which is replaced by cool water from beneath. This is one of the major mechanisms for generating upwelling of nutrient rich waters. Upwelling in the clear waters of the GBR appears to an oxymoron as tropical waters are generally thought to be oligotrophic. 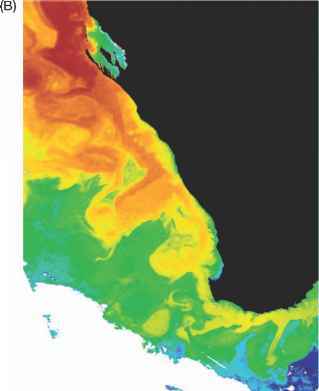 However, upwelling has been documented along the shelf break of the GBR and the resultant mixing of nutrients with planktonic assemblages results in clear chlorophyll signatures that can be detected from space (Fig. 4.5). The cool water will often not reach the surface, it typically slides over the shelf as a high density water mass that remains close to the substratum; in some cases these intrusions can make it most of the way across the shelf. Although data on the periodicity of upwelling are sparse, we would predict that up-welling would be most common from November to March when winds from the north are most common. Wind and associated wind-driven swell often has a great influence on circulation patterns in lagoons. Because waters of lagoons are often shallow (1-4 m deep) a combination of the wave set and wind will facilitate lagoon flushing as found at One Tree Island. The fish, corals and other invertebrates spawn eggs and sperm at particular times of the year. The eggs are fertilised and the larvae that develop will drift with the water. The level to which reefs are self-seeded in these larvae (i.e. larvae that return to their natal reefs) and to which reefs are connected (i.e. the exchange of larvae between reefs) partly depends on the water currents during the drift period. 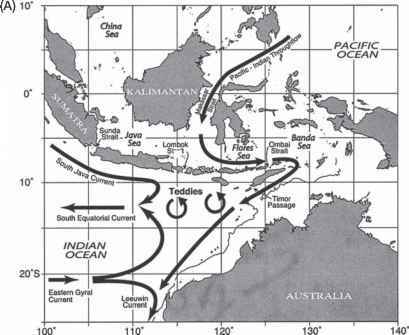 Since these currents vary with the wind and the influence of the SEC—itself controlled by large scale oceanic features within the Coral Sea—oceanography predicts that the level of self-seeding and connectivity may vary seasonally and interannually from reef to reef. 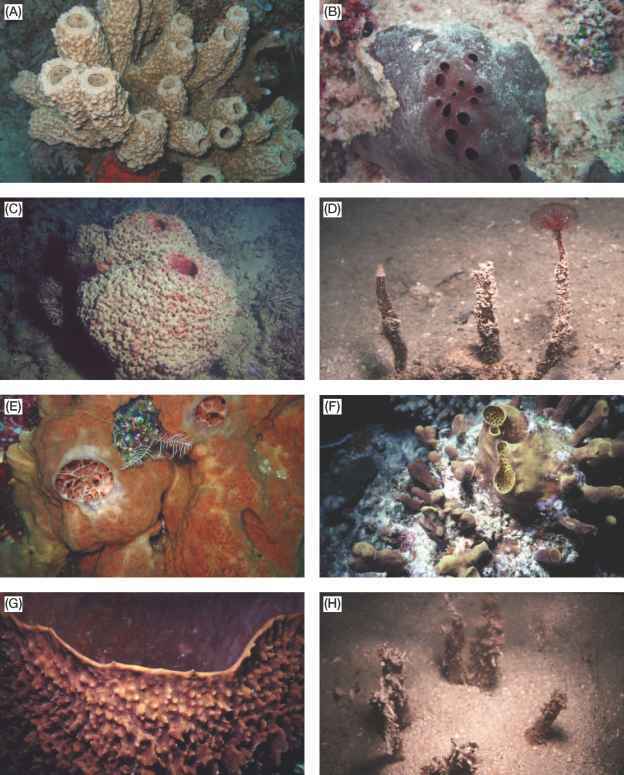 In areas where the reefs are scattered at relatively low density on the shelf, a reef is usually both self-seeded and connected with other reefs located 'upstream'. In areas where the reefs are scattered at high density, the currents are steered around the dense reef matrix instead of flowing through the reef matrix, akin to a sticky water effect; reefs within the dense matrix are highly self-seeded and little connected with reefs outside. Recent evidence indicates that self seeding by recruit fishes can be as high as 30% to 60% and it is likely that the behavioural abilities of presettlement fishes as well as current influence connectivity. Riverine input to the GBR is substantial and it has its greatest impact near-shore (within 10 km of the mainland) and in and around what would be considered 'inner' reefs of the GBR. The river plumes also impact mid-shelf and outer reefs in the Cairns area (Fig. 4.7 and 4.8). Patterns of rainfall vary along the GBR. Largest rainfall occurs north of Hinchinbrook Island (near Tully). There is a distinct seasonal pattern to rainfall where there is a rainy season that extends from c. December to April. Major perennial rivers such as the Normandy and Daintree are in this area (see Chapter 11). Muddy marine snow flocs as large as several millimetres are formed and carried in suspension by the aggregation of mucus and mud, and they support intense biological activity. The mucus is formed by bacteria and plankton, and this is enhanced by nutrients from land runoff. The mud is brought in from river plumes, wave resuspension and bottom-tagging nepheloid layers. These aggregates settle in quiescent areas in calm weather, as controlled by the oceanography, and being very sticky can readily smother coral polyps and organisms living on coral reefs. This mud can later be resuspended by waves and is carried away but the reef damage has been done in the meantime. Freshwater input has a great influence on the biology of inshore waters. In many parts of the world it has been demonstrated that catch and recruitment rates of prawns and fishes vary with freshwater input. Recruitment rates usually go up with input of freshwater. Changes in freshwater runoff may happen through anthropogenic alteration of catchments and through changes in rainfall that relate to global warming (see Box 4.2). There is concern that an increase in runoff and nutrients could affect inner shelf reefs through phase shifts (i.e. from coral to algae) and the survival of crown-of-thorns starfish (COTS) larvae. The wet season is the same as the cyclone season and river floods often result from cyclones. Cyclones can thus be very destructive because of the huge input of sediment and freshwater input to the GBR and also of wave height on reefs. Physical destruction can be considerable and the swath of damage is asymmetrical with respect to the position of the eye of the cyclone. Cyclones rotate clockwise in the southern hemisphere and anticlockwise in the northern hemisphere as typhoons (Asia) or hurricanes (America). The impact of cyclones on the GBR is greater on the southern side of the eye due to the greater fetch from the open ocean and the larger wave height. The destruction of reef habitat and death of organisms can be substantial. Storm swell can blast large chunks of coral (including large Porites) onto the reef flat. Damage will usually only be to the windward side of reefs, but life on coastal fringing reefs can be all but obliterated. Great changes in habitat type (e.g. from a species rich assemblage of live coral to coral rubble) will have a great influence on local species diversity of most taxa (see Chapter 5). Burgess, S. C., Kingsford, M. J., and Black, K. P. (2007). Influence of tidal eddies and wind on the distribution of presettlement fishes around One Tree Island, Great Barrier Reef. Marine Ecology Progress Series 341, 233-242. Glynn, W. (1988). 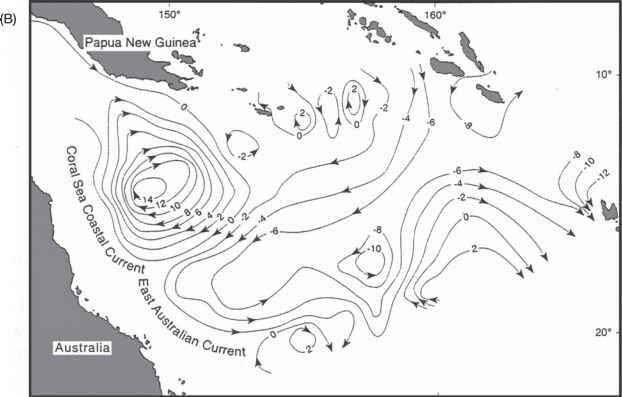 El Nino-Southern Oscillation 19821983: Nearshore population, and ecosystem responses. Annual Review of Ecology and Systematics 19, 309-346. Kingsford, M. J., Wolanski, E., and Choat, J. H. (1991). Influence of tidally induced fronts and Langmuir circulations on distribution and movements of presettlement fishes around a coral reef. Marine Biology 109, 167-180. Suthers, I., Taggart, C. T., Kelley, D., Rissik, D., and Middleton, J. H. (2004). Entrainment and advection in an island's tidal wake, as revealed by light attenu-ance, zooplankton, and ichthyoplankton. Limnology and Oceanography 49(1), 283-296. Andrews, J. C., and Gentien, P. (1982). 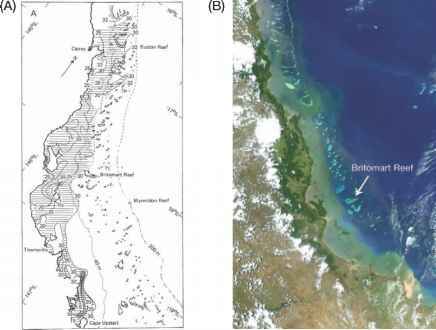 Upwelling as a source of nutrients for the Great Barrier Reef ecosystems: A solution to Darwin's question. Marine Ecology Progress Series 8, 257-269. Sea into the Great Barrier Reef. Estuarine, Coastal and Shelf Science 54, 655-668. Burrage, D., Steinberg, C. R., Skirvig, W. J., and Kleypas, J. A. (1996). 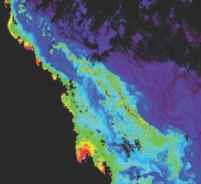 Mesoscale circulation features of the Great Barrier Reef Region Inferred from NOAA Satellite Imagery. Remote Sensing of Environment 56, 21-41. Nof, D., Pichevin, T., and Sprintall, J. (2002). Teddies and the origin of the Leeuwin Current. 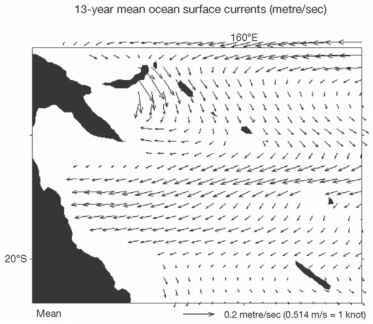 Journal of Physical Oceanography 32, 2571-2588.